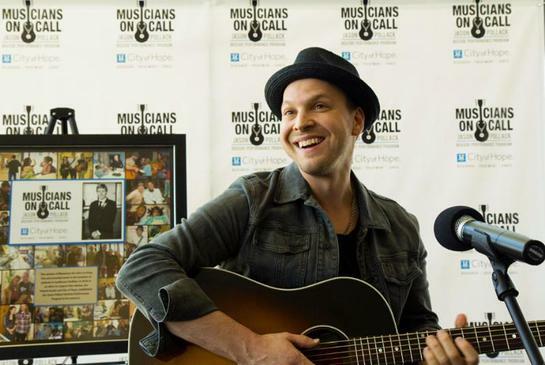 Cancer patients at City of Hope were surprised with an intimate performance by Grammy-nominated musician and songwriter Gavin DeGraw as charity organization Musicians on Call launched a new program specifically for the Los Angeles-area cancer research and treatment center. The program ­– officially called The Musicians On Call Jason Pollack Bedside Performance Program at City of Hope – will bring live, in-room performances to patients undergoing treatment or unable to leave their hospital beds. As with all Musicians On Call programs, the performances are meant to bring the healing power of music to those patients who need it most. At City of Hope, the program began with a formal launch by Musicians On Call members, City of Hope staff and music industry executives. Alissa Pollack, EVP of Music and Partner Integrations at Premiere Radio, started the program in honor of her father who passed away from cancer last year. During the event, she gave a moving and heartfelt tribute to Jason Pollack’s legacy. Funds raised in memory of Jason Pollack at Taste for Hope, City of Hope’s Music, Film and Entertainment Industries Group’s flagship event in New York, were used to make the Musicians On Call program at City of Hope possible. Musicians On Call’s president, Pete Griffin, spoke of Pollack’s spirit and dedication to the cause. DeGraw then brought his guitar out and sang “Chariot” to a large group of patients that had gathered inside City of Hope Helford Clinical Research Hospital. DeGraw has worked closely with Musicians On Call over the years and spent time connecting individually with many patients. As a comprehensive cancer center committed to treating the whole patient, City of Hope understands that music can lift the human spirit and enhance treatment programs. The Musicians On Call Jason Pollack Bedside Performance Program will be a special part of supportive care at City of Hope, bringing music, sing-alongs and special visitors to patients in need of an emotional boost. Studies have shown that live music soothes hospital patients by lowering blood pressure and reducing anxiety. For cancer patients, whose treatments often keep them hospitalized for long periods of time, the positive impact of these performances can be especially powerful. An array of musicians will come to City of Hope every Friday afternoon to perform for patients in the pediatric unit and other floors of the hospital. A Great Big World, Ingrid Michaelson, R5, Ryan Cabrera, Bean, Oh Honey and Straight No Chaser a cappella group are some of the upcoming artists that will participate in the Musicians On Call Jason Pollack Bedside Performance Program at City of Hope.